Travis McCready, President & CEO of Massachusetts Life Sciences Center, sounds the gong and opens the trading day at the Amsterdam exchange for the Global Scale-up Program. The Global Scale-up Program is a unique pressure-cooker preparation program to prepare ventures in life sciences and medical devices for an international product launch. The program combines in-depth training and mentoring by the best serial entrepreneurs, marketing experts, and investors from the United States and different European countries. The Global Scale-up Program is organised by Hyphen Projects, Health~Holland and Maastricht University. The 10th edition of the Amsterdam City Index 2018, the economic barometer of the bustling city of Amsterdam, rises up with 2 points to 122! 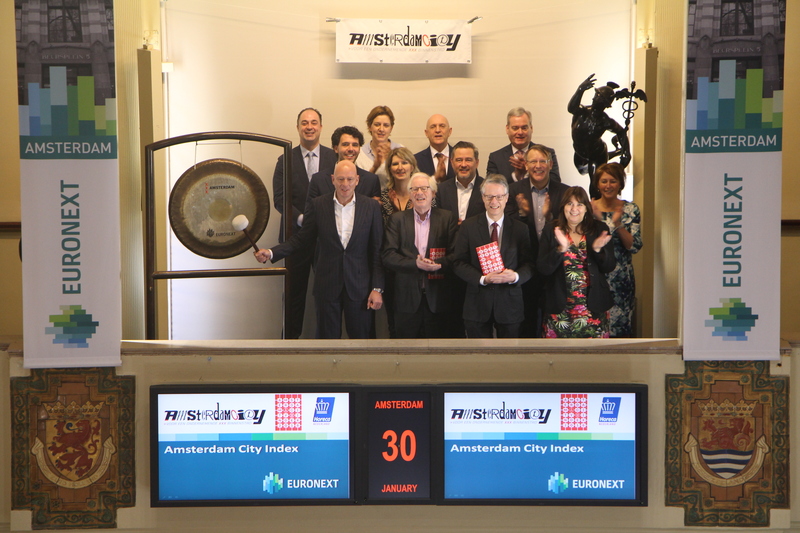 The Amsterdam City Index 2018 was recently presented at the Beurs van Berlage in the annual event organized by Amsterdam City. Amsterdam City is the initiator and producer of the Amsterdam City Index.. Amsterdam City is an association of retailers, hotel and catering industry, institutions and cultural organizations in the inner city of Amsterdam. Primary goal of Amsterdam City is an economically healthy and diverse city, the focus of the association is to promote and improve the economic climate in the center of Amsterdam. 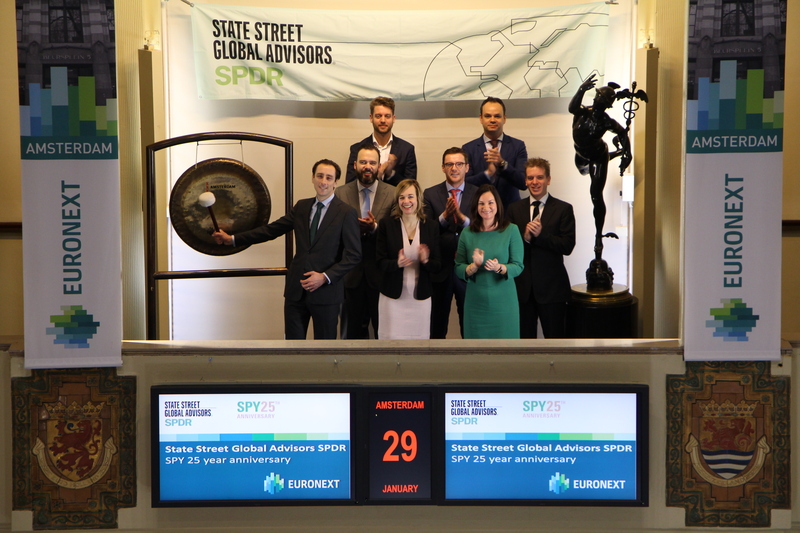 State Street Global Advisors, the asset management business of State Street Corporation , marks the 25th anniversary of the first ever US-listed exchange traded fund (ETF), the SPDR S&P 500 ETF, by sounding the gong on the Amsterdam exchange. Launched 29 January 1993, SPY is currently the world’s largest and the most traded security in the world. For nearly four decades, State Street Global Advisors has been committed to helping financial professionals and those who rely on them achieve their investment objectives. They partner with institutions and financial professionals to help them reach their goals through a rigorous, research-driven process spanning both active and index disciplines. They take pride in working closely with their clients to develop precise investment strategies, including their pioneering family of SPDR ETFs. From Friday 26 to Sunday 28 January, Leeuwarden-Friesland 2018, European Capital of Culture will officially be opened. On this occasion they open trading together with main sponsor ING. Leeuwarden-Fryslân 2018 marks the start of a new Renaissance in thinking that will begin in the Dutch Province of Friesland and, they hope, spread all over the world. This is the year for them to display their unique cultural heritage to let the world know that the courage to be different is essential for realizing greater dreams and diversity on an international scale. The program entails about 60 main program events and hundreds of smaller initiatives spread over the entire province. 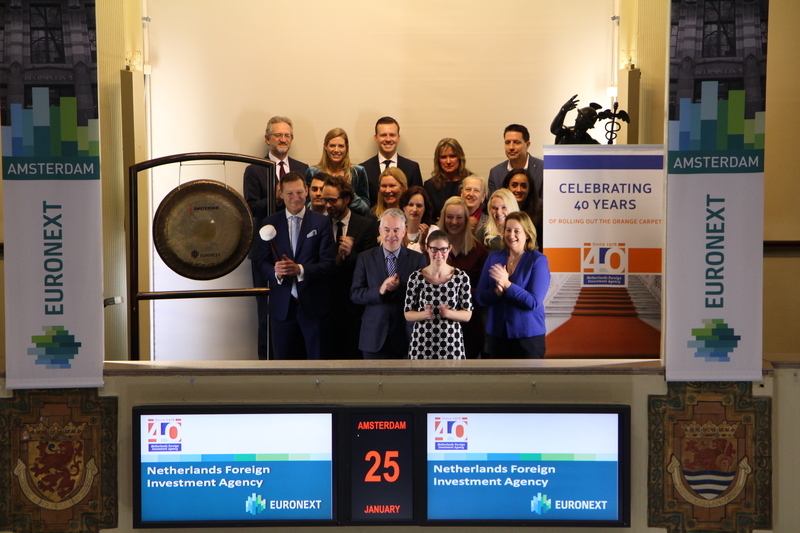 Commissioner at the Netherlands Foreign Investment Agency (NFIA), Jeroen Nijland, opens trading on the Amsterdam exchange by sounding the gong. NFIA is celebrating the publication of its annual results for 2017, as well as marking its 40th anniversary this year. For 40 years, the NFIA has served as a one-stop-shop for successful European expansion, supporting more than 4,000 companies from some 50 countries to establish or expand their business in the Netherlands. An operational unit of the Ministry of Economic Affairs and Climate Policy, NFIA helps and advises foreign companies in all phases of establishing, rolling out and/or expanding their international operations in the Netherlands. Fueled by public-private partnerships and Dutch innovation across industries, the Netherlands continues to draw interest from international companies. The NFIA is their first port of call, connecting them with its regional partners in the Invest in Holland Network, as well as free and confidential resources and tools they need to make their investment decision. 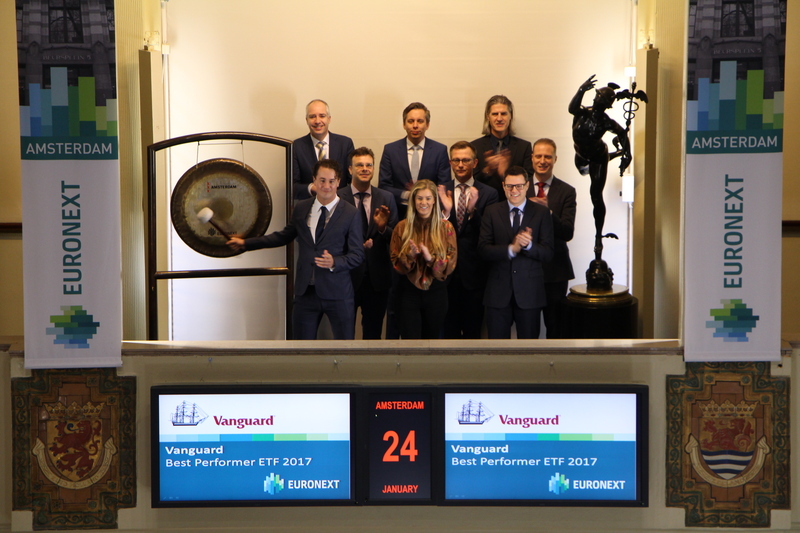 Vanguard, a pioneer of index-investing, received the “Best Performer ETF 2017” Award from Euronext Amsterdam. The award recognises the popularity of the Vanguard S&P 500 UCITS ETF among investors in 2017. Vanguard looks to provide investors with low-cost, high-quality, and broadly diversified funds and ETFs with they can put together balanced, long-term investment portfolios. Nyenburgh offers, through a partnership, professional traders the opportunity to rent a trading desk on the floor of Euronext or at any other location. This activity was previously executed by its subsidiary Global Exchange Trading Services B.V. (GETS). After MiFID II all partnerships with GETS have been transferred to Nyenburgh Holding. On this occasion they open trading on the Amsterdam exchange. Nyenburgh Holding B.V. was founded in 1996 and trades on its own account in cash equities and derivatives, and has access to multiple exchanges in and outside Europe. Nyenburgh has grown rapidly in recent years, partly because of its very competitive trading costs, service and transparency. 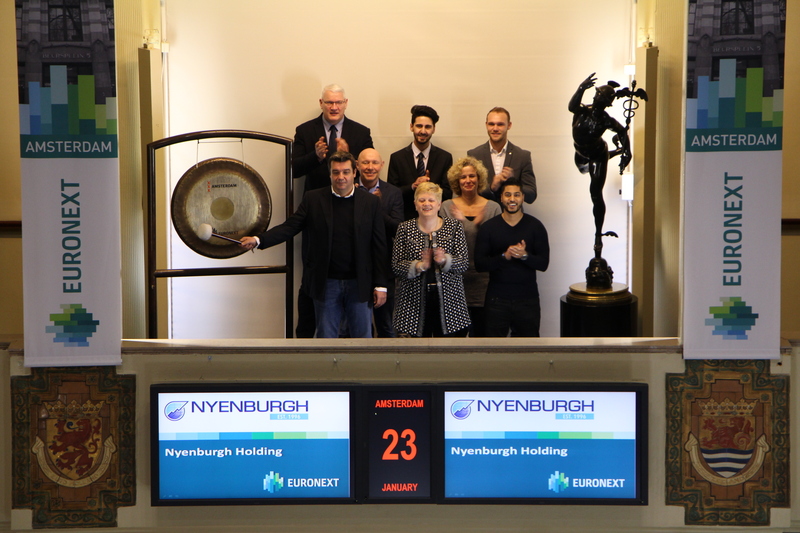 Nyenburgh is located on the former trading floor of Euronext and has acquired a unique position within the professional trading community in the Netherlands. 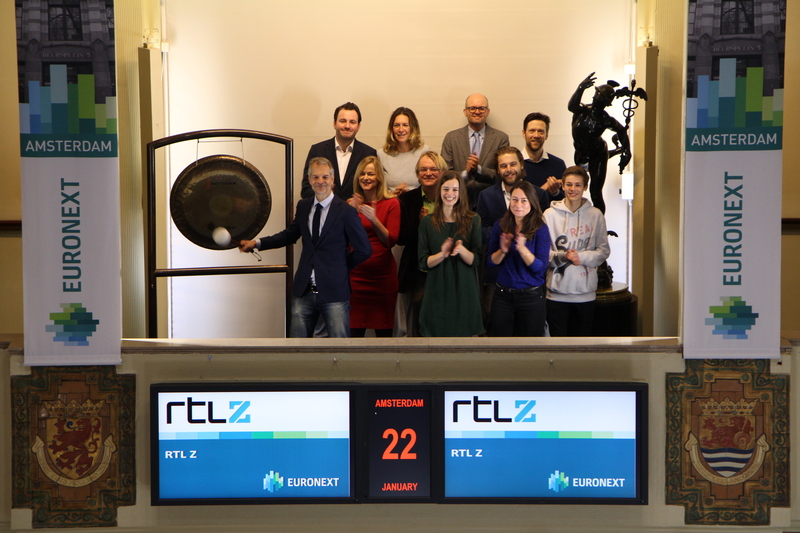 Roland Koopman, presenter RTL Z, sounds the gong at the Amsterdam exchange to give attention to the Beurs Inside LIVE event. RTL Z Beurs organizes Inside LIVE on Monday 19 February in the Beatrix Theater Utrecht. Experts give investment tips and enter into discussions with each other. With Roland Koopman, Janneke Willemse, Bob Homan (ING), Jim Tehupuring (ProBeleggen), Willem Middelkoop (CD Fund), and many others. 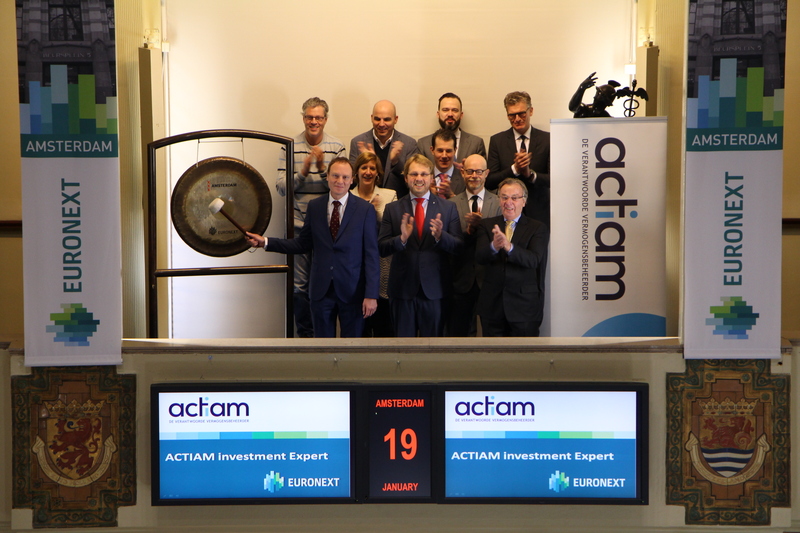 The winner of the ACTIAM investment expert poll opens trading at the Amsterdam exchange by sounding the gong. The 2017 winner of the ACTIAM investment expert poll is Niels de Graaff van Holding BDG, formerly a portfolio manager at ACTIAM. His picks were the best of all participating experts. Every year asset manager ACTIAM asks over a hundred investment professionals for their expectations for the best and the worst stock in the coming year. Besides that, the participants are asked for their expectations for the AEX-index. This poll has been conducted since 1994. Roca Markets is proud to be a supporter of Kanjer Wens in 2017 and 2018. As part of their policy of contributing a sizeable percentage of their company profits to charity, Kanjer Wens was chosen this year and last year to be one of their beneficiaries. 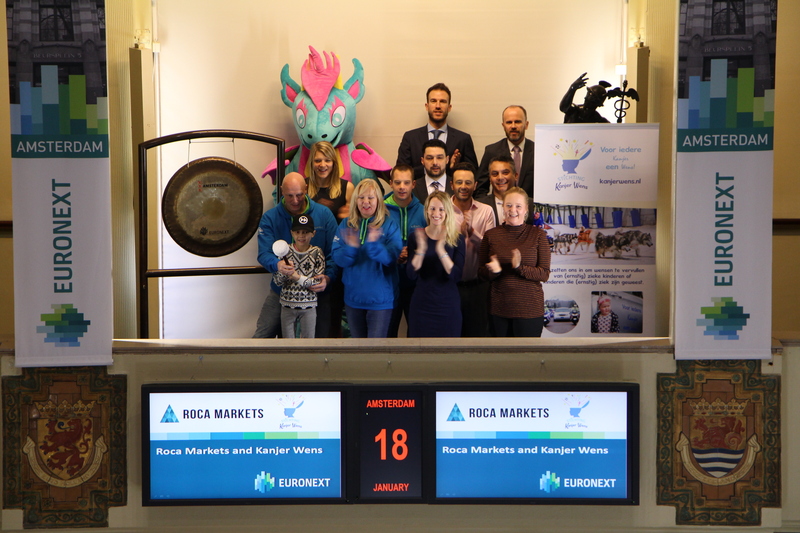 Roca Markets is a market maker in derivatives, that is based in Amsterdam at the Beursplein 5 exchange building. The company has been in operation since 2012 and continues to expand their business in the derivatives field in Europe. During this time they have been major contributors to a number of charitable organizations. Stichting Kanjer Wens is a new charity organisation, which will celebrate their first anniversary in February this year. They fulfil wishes for children between 4 and 17 years with a life-threatening illness or severe chronical disease. Every child who is ill, has only one big wish, to get better. They cannot cure but they can give a child a day to remember. Holland FinTech organizes the Annual Member Summit. This year the host is AFS Group, a financial service provider specialized in the business segment and also affiliated with Holland FinTech. 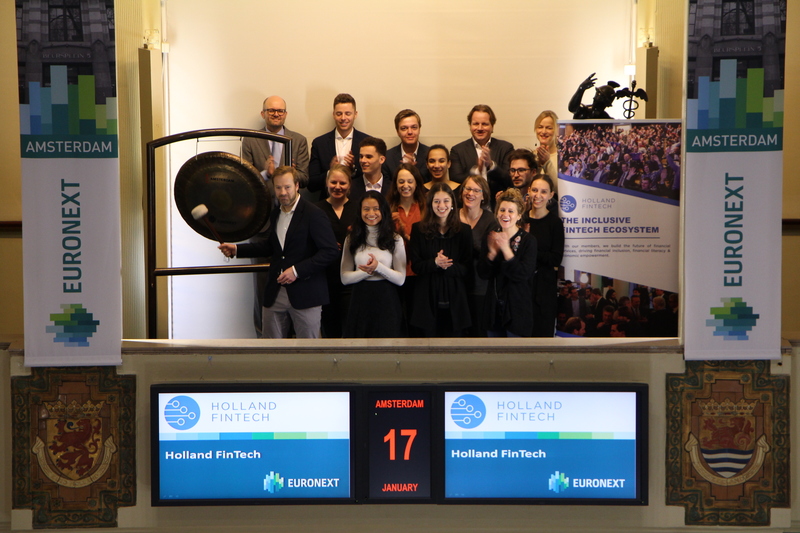 Three years after the establishment of Holland FinTech, she brings together more than 320 affiliated parties. During the Summit, they look forward to the new year. The day starts with the opening of the trade on the Amsterdam exchange. By linking parties from large to small, the organization is committed to accelerating innovation in this sector. With events and matchmaking they bring expertise together and stimulate new developments. Currently, more than 320 parties are connected within the network, different from large established parties and new startups with ideas that improve decades of old processes. Only by working together can progress be made and the Netherlands can put itself on the map as progressive in financial innovation. The Stadmakertjes Foundation (‘little citymakers’) has organized the junior election ‘Amsterdammertje van het Jaar’ for the sixth time. The City of Amsterdam and Rabobank support this initiative financially. In the past couple of months, everyone in Amsterdam could nominate their little hero, aged 8 to 15 years. A jury chose the top 10 finalists and the winner. The most important selection criteria: the winner should be someone who is selflessly committed to something or someone, and sets an example for others. IMC Weekendschool Amsterdam Zuidoost is celebrating its twentieth anniversary this year. To kick off this special anniversary year, a delegation of pupils and alumni will sound the gong. IMC Weekend School is a supplementary school for children (aged 10-14) in underprivileged neighborhoods, often of immigrant backgrounds, in the larger cities of the Netherlands. Through a three-year course, professionals (volunteers) introduce students to a wide range of topics, including journalism, medicine and law but also training in presentation, research, debate and conflict resolution. It is an education focused on developing an all-round character. IMC Weekend School connects youth to passionate professionals who engage them in their fields. The contacts created between social classes affect both the students and the guest teachers. In the alumni program, guest teachers, sponsors and Weekend School alumni stay connected, and develop professional relationships. Research shows that IMC Weekend School alumni have better professional prospects, are more confident, and feel more connected with society than control groups. The winners of the Dutch IR Awards 2018 visit Beursplein 5. David Tailleur, Director of Investor Relations at the Euronext Amsterdam listed Randstad (ticker symbol: RAND) and winner in the AEX professional category, sounds the gong. The Dutch Association for Investor Relations (NEVIR) presented the Dutch IR Awards 2018 last night. For the eleventh year in a row, prizes were awarded to Dutch listed companies and professionals who excel in Investor Relations. An independent expert jury consisting of Corné van Zeijl (ACTIAM), Frederik van Beuningen (Teslin), Holger Weeda (BNP Paribas IP), Joop Witteveen (Kempen), Maarten Verbeek (the IDEA!) And Willem Burgers (Add Value Fund), determines who are the winners in the different categories. NEVIR is the professional representative body and the interest group for Investor Relations professionals of Dutch listed companies. 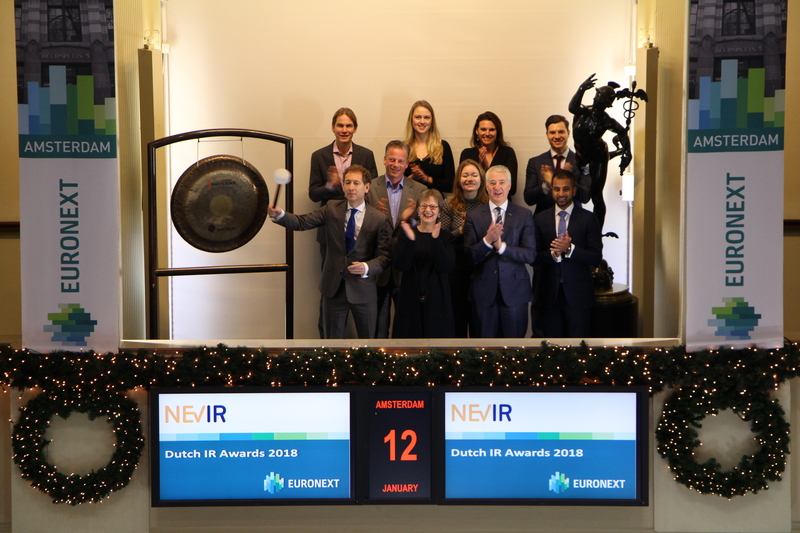 More than 70% of Euronext Amsterdam listed companies are NEVIR member. Chief Compliance Officer and co-owner of Algorithmic Trading Group (ATG), Jochem van Steijn, gives the starting signal of the trading day at the Amsterdam stock exchange by sounding the gong. ATG celebrates obtaining its trading license under MiFID II. ATG is a young trading company founded in October 2008 in Hong Kong by Tom Voûte. ATG specializes in algorithmic trading on the global financial markets. ATG is based in Hong Kong and the Netherlands, where it recently moved to Beursplein 5. Fintessa Vermogensbeheer celebrates its 10-year anniversary this month. At the start of 2008, Martine Hafkamp and Han Schulten, together with Mark Sombekke and Jan Bouius, began to offer investment services under the name of Fintessa Vermogensbeheer, being authorized by both the AFM and DNB. 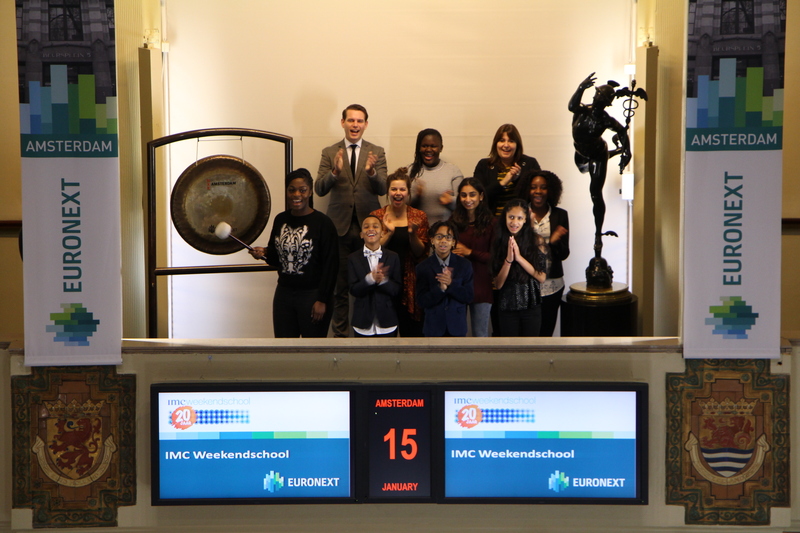 To celebrate their 10-year jubilee, Martine Hafkamp sounds the gong on the Amsterdam exchange. 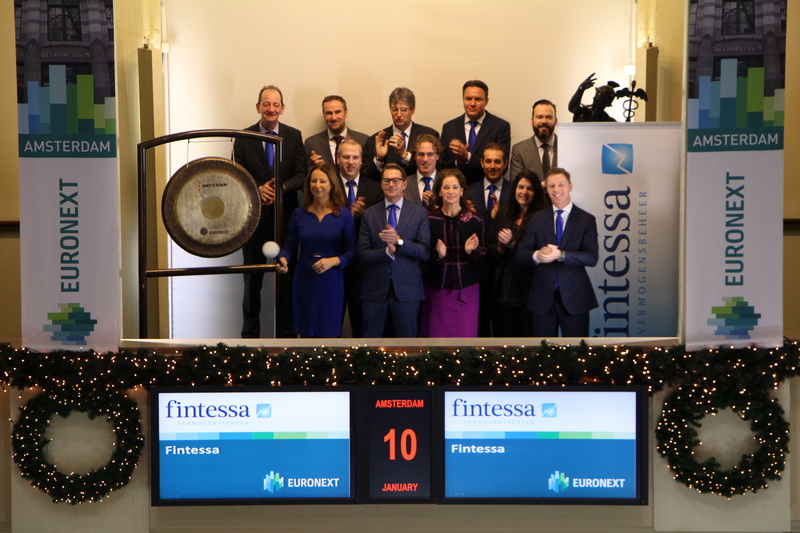 Over the past 10 years, Fintessa has grown into one of the larger independent asset managers in the Netherlands. Fintessa mainly works for private individuals and (former) entrepreneurs, but also for foundations and institutes. This independence ensures that free investment choices are made without own products or forced shopping. The Idea-Driven Equities Analyzes Company ('the IDEA!') 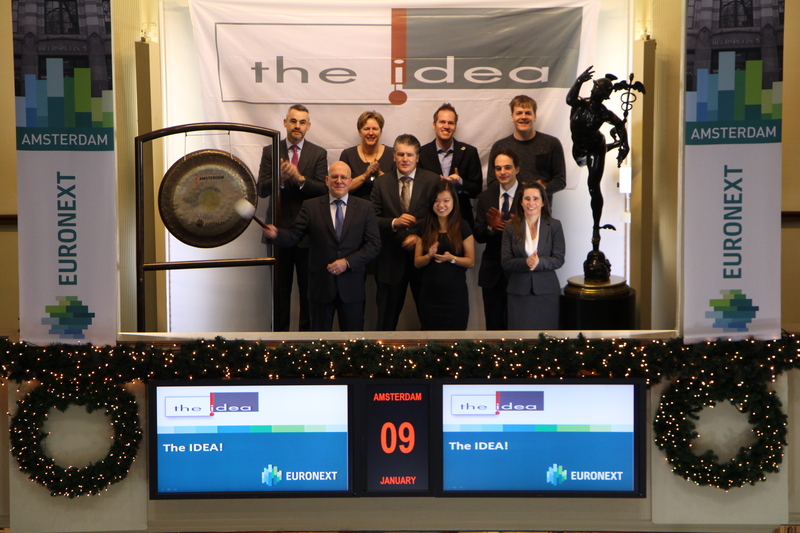 celebrates its tenth anniversary by sounding Euronext Amsterdam's gong and opens the trading day. The company was founded by Henk Slotboom and Maarten Verbeek and started its activities in 2007. Together with Paul Hofman, the IDEA! has about eighty years of sector experience and has become the leading independent research-only boutique in the Benelux. the IDEA! focuses on presenting attractive investment propositions in the Benelux to its clients, with the emphasis on providing all relevant information and knowledge needed to be able to form their own judgment. Started on January 1st 2018, Michiel Assink is the new Managing Director of WDP Netherlands and sounds the gong on the Amsterdam exchange together with his new colleagues. After a running period, Michiel Assink will take over duties of former Director of the Netherlands, Rien van Ast, who at own request will dedicate himself exclusively to the realization of complex projects. Michiel Assink was previously active at real estate agency CBRE, where he led the Industrial & Logistics team and built a team with strong focus on users, investors and developers of logistics and industrial properties. 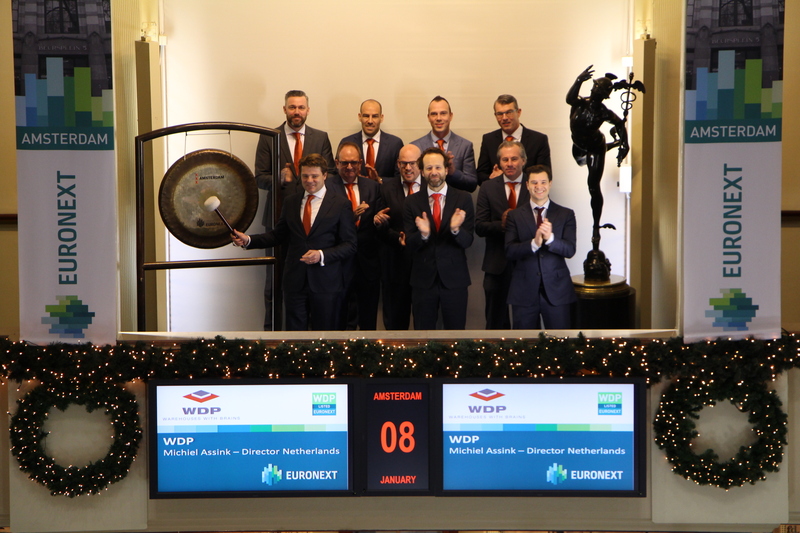 Listed on Euronext Brussels and Amsterdam, the logistics real estate specialist WDP (ticker symbol: WDP) was named Company of the Year in Belgium in 2017 and continues to grow the operating teams by recruiting extra project- and facility managers. AFS Group announces to be the first in the Netherlands to have officially received its license to operate as an Organized Trading Facility (OTF) under MiFID II. AFS OTF is the first-of-its-kind in the Dutch market and will operate as a discretionary voice/chat trading system. This allows investment firms to execute various financial instruments on-venue. Additionally, AFS OTF will be regulated by AFM and must comply with certain rules. The reporting and publishing requirements will be satisfied by AFS’ use of Euronext APA and ARM. By operating as an OTF, AFS can play a valuable role in achieving the most important objectives under MiFID II. More specifically, to provide more protection for investors and to increase transparency in the various asset classes. AFS Group is a medium-sized financial services provider specializing in the mediation of financial instruments and green certificates. With 90 employees, from 4 offices AFS serves more than 1,000 complete sales parties: asset managers, banks, companies and other non-financial institutions. For more than ten years, Gouden Stier has been rewarding brokers with awards. ING received two prizes at the end of 2017 in two categories: ‘Best investment institution’ and ‘Best technical Analyst’. Bas Heijink sounds the gong and opens the trading day at the Amsterdam exchange. ING may call themselves the best investment institution in the Netherlands for a year. They are particularly appreciated for their visibility in the market, successful innovation and the impactful growth they are experiencing. Bas Heijink won the Gouden Stier in the category 'Best Technical Analyst', just like last year. A reward for his work after he was already voted 'Best Investment Expert' in 2014. By sounding the gong, DSI wishes all organizations part-taking in DSi and all professionals a happy New Year. As of 3 January 2018, the compulsory ESMA Guidelines of the European Securities and Markets Authority on knowledge, skills and expertise will come into force. These guidelines are part of MiFID II. DSI ensures that financial professionals who are fully DSI-certified comply with the ESMA criteria. DSI implements strict self-regulation at the request of the sector. Here, implementation implies through personnel screening, certification, disciplinary law and a public register. The foundation screens (new) employees in the sector and certifies staff. The certificate holders also regularly check on integrity, knowledge and professional competence. 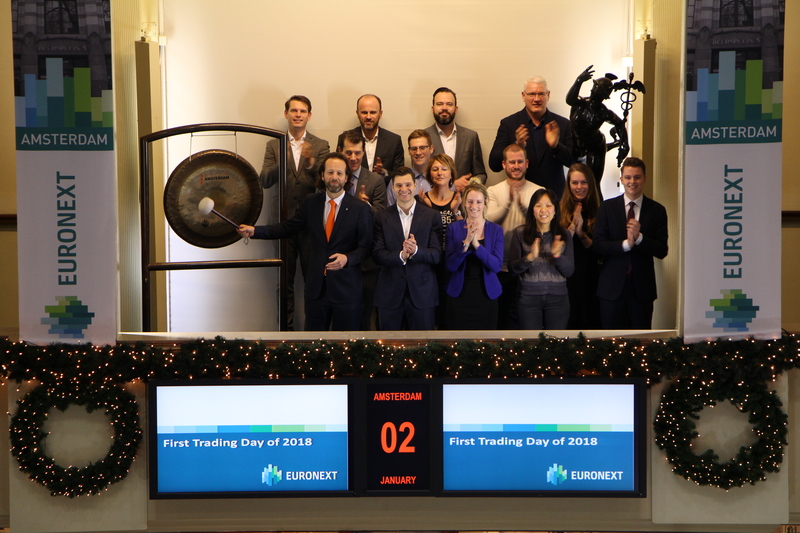 With the sounding of the gong Euronext wishes you all a prosperous New Year on the first trading day of 2018. Euronext is the leading pan‐European exchange in the Eurozone with nearly 1,300 listed issuers worth close to €3.6 trillion in market capitalisation as of end September 2017, an unmatched blue chip franchise consisting of 24 issuers in the Morningstar® Eurozone 50 Index℠ and a strong diverse domestic and international client base. Euronext operates regulated and transparent equity and derivatives markets. Its total product offering includes Equities, Exchange Traded Funds, Warrants & Certificates, Bonds, Derivatives, Commodities and Indices. Euronext also leverages its expertise in running markets by providing technology and managed services to third parties. 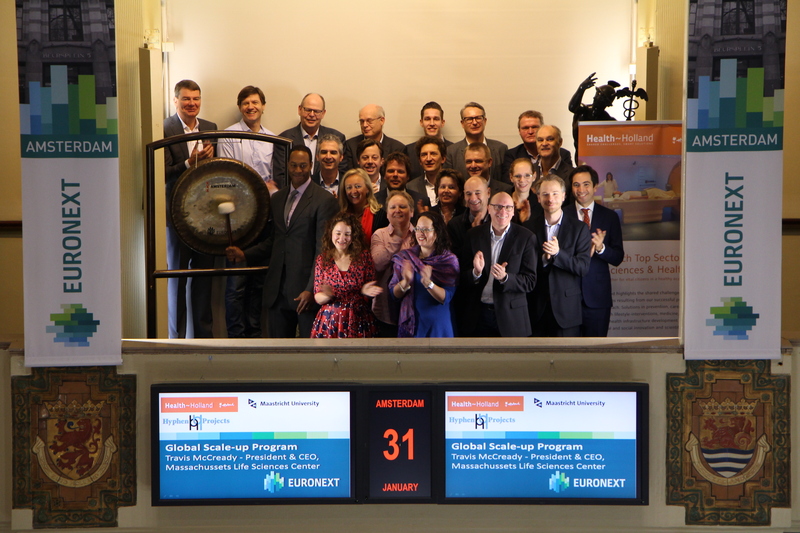 In addition to its main regulated market, Euronext also operates Euronext GrowthTM (formerly known as Alternext) and Euronext AccessTM (formerly known as the Free Market).